Though this year is actually the 101st anniversary of the Princess Mary Gift Fund, established in 1914, I thought I would write about it anyway since we spent last Christmas on the Christmas Truce. 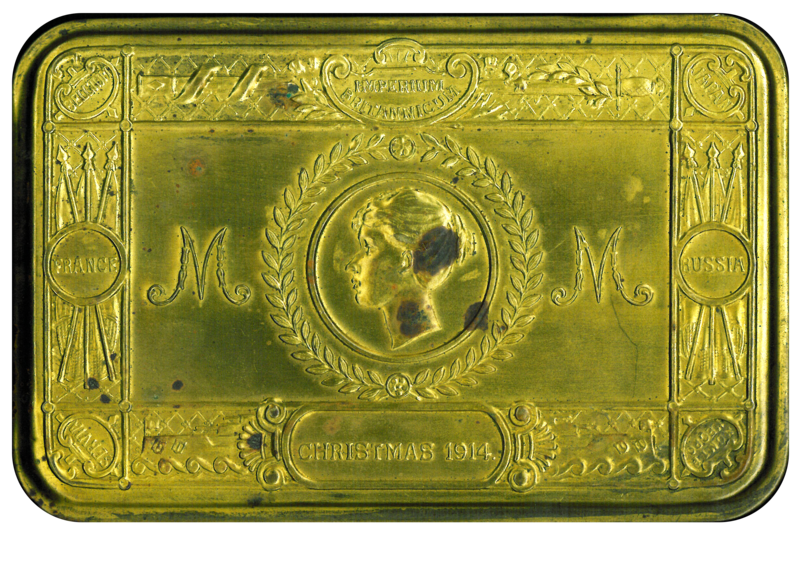 It may grab the imagination less than the idea of the war stopping for a day on the Western Front for everyone to meet in No Man’s Land, but the Princess Mary Gift Fund ensured that every person serving abroad as part of the British Empire’s armies received a Christmas gift. The Princess Mary, George V’s third child and only daughter, was 17 when the war broke out in the late summer of 1914. In October of that year the princess began to raise money for what was at that time called the “Sailors & Soldiers Christmas Fund”; originally she had intended to fund the project personally, but it was decided that this was not possible and the Fund was established for public contributions. In total, the Fund raised over 162 000 pounds, much more than was actually needed for the project, which was eventually expanded to include nurses, those in hospital, prisoners of war and the next of kin for those killed in the fall of 1914. Wartime shipping meant that full distribution of the boxes was still not finished by the end of the war, and veterans of 1914 were still receiving their boxes in 1920. The gift itself was an airtight brass tin with a relief of the Princess on the lid and decorative roundels showing the names of the Allies; the box contained tobacco, cigarettes and a Christmas card with additional different versions for non-smokers and Sikh members of the Indian Army. Non-smokers received writing stationary and a photograph of the Princess, and Sikhs sugar candy and spices. Nurses received a version with chocolate and the card only, since both the non-smoking and smoking versions were considered inappropriate for ladies. In all, over 2 million people received the gift box courtesy of the Fund, many of which were reused for storage and remain treasured family heirlooms today. The Princess Mary did not remain idle after her first philanthropic efforts. She was active in promoting the Girl Guides, the Land Girls and the VADs throughout the war and trained as a nurse in 1918. Princess Mary remained active in the promotion of nursing and women’s activities throughout her life, eventually serving as Commandant-in-chief of the British Red Cross Detachments and chief controller of the Auxiliary Territorial Service. She died in 1965 at her home in Harewood. Love the waves at the bottom of the tin. Best wishes for the holidays and the new year to all of you at CCGW. Thank you! We hope you had a wonderful holiday too!